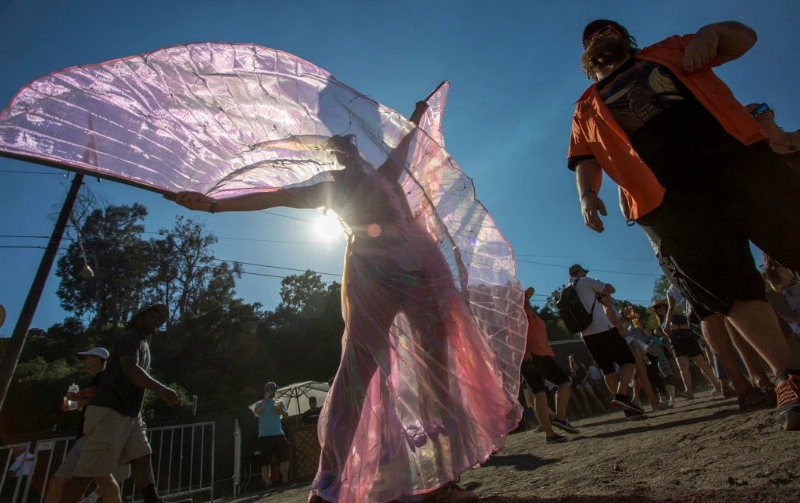 Arroyo Seco Weekend returns to Pasadena this month. From an outdoor film series with food trucks and bands to a flower-art pop-up in Griffith Park, June is chock-full of good stuff to do. The roving outdoor screening org has four classics and a new favorite on tap this month, beginning with Tommy Boy (June 2). The Princess Bride, The Big Lebowski, Clerks, and Lady Bird follow. As for the “eat” and “hear” portions of the program, food trucks and local bands are on hand at every flick. iPic’s creature comforts are nice, but it’s hard to beat the gilded glamour of L.A.’s historic movie palaces. The Los Angeles Conservancy shows oldies (but goodies) in a few of our architectural stunners, including Who Framed Roger Rabbit? at the Los Angeles Theatre (June 16) and Steamboat Bill, Jr. at the Orpheum (June 20). L.A. chefs team up with No Kid Hungry at this culinary extravaganza to raise funds for reducing childhood hunger. Swing by Culver City’s Media Park for samples of Thai dishes from Jitlada, NOLA-style eats from Preux & Proper, scoops from McConnell’s, and more. Feel good about treating yourself (read: spending all your money) at this marketplace, which showcases sustainably made, waste reducing goods. A slew of artisans post up on Hillhurst Avenue in Los Feliz between 11 a.m. and 6 p.m., including hometown makers like Rx Candles, Iron Lily activewear, and Nora Floral Studio. It’s not the Amgen Tour of California, but the Los Angeles County Bicycle Coalition’s annual ride offers routes for everyone: Serious types can get in a real thigh-grinder on the 100-mile course, while newbies can breeze through the 15-mile family route. Stick around postride for live music and a raffle. The Shakespeare Center brings sonnets and soliloquies back to the Veterans Affairs campus in Westwood after a nearly four-year hiatus with its production of Henry IV. The biggest draw: Tom Hanks stars as Falstaff in the actor’s local theater debut. The best part: There are 2,000 free tickets for vets and active military members. The Greystone Estate is like the Wonka Factory of Beverly Hills: Nobody ever goes in, and nobody ever comes out. This month, you can take a rare tour of Edward Doheny’s Tudor Revival-style home, built in 1928 by Gordon B. Kaufmann, who designed the L.A. Times building. Come see about Diana Ross at the Hollywood Bowl—the Supremes songstress and solo diva is kicking of the venue’s summer season. Catching a Motown legend in the flesh is thrilling enough, but if you need some extra icing on your imaginary cake, there will be fireworks, too. L.A.’s unofficial official pastry gets its moment in the sun at Union Station. Vendors are slinging all types, from cake to glazed to trendy third-wave varieties. Don’t skip the “live fry” station, where a hero in a chef’s hat serves up hot doughnuts to order.